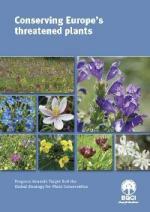 'Conserving Europe's threatened plants: Progress towards Target 8 of the Global Strategy for Plant Conservation' is BGCI's latest publication, was launched at at the fifth European Botanic Gardens Congress: Botanic gardens in the age of climate change, in Helsinki, Finland. The continuing loss of biodiversity in Europe is a major concern, with less than half protected species and habitats considered to be in favourable conservation status. In answer to this question, we have identified 1,917 threatened European taxa, or 15% of the entire European flora. This list is based largely on national Red Lists and species distribution data. Target 8 of the GSPC calls for 75% of threatened plants in ex situ collections and 20% of them available for recovery and restoration programmes by 2020. Since there is no European Red List of Plants, there has previously been no means to measure progress towards this target. Now we have this list, it gives us some means to prioritise actions and ensure the 75% target is met by 2020. From this consolidated list of threatened plants we have identified some 42% as being present in seed banks or living collections in botanic gardens around the world. There is still much to be done, we need to assess the conservation value of the living collections of threatened European flora, as well as develop partnerships between conservation agencies to prioritise and coordinate action and share data. We'll also be linking our European threatened plant list to the PlantSearch database, please get in touch with us if you'd like to know more. The report also includes a number of case studies on the conservation work underway in botanic gardens in Europe, let us know if you have a case study you'd like to share.